Anyone here who tried using the following commercial tool developed by the authors (disclaimed in the competing interests)? How would it compare with aging.ai our young.ai? Finally I wonder to which extent the SHAP (SHapley Additive exPlanations) plots might ease the determination of the relative weights importance of the Levine's Phenotypic Age as discussed here. Indeed it looks to me the technique does just that: "...SHAP plots of input markers. 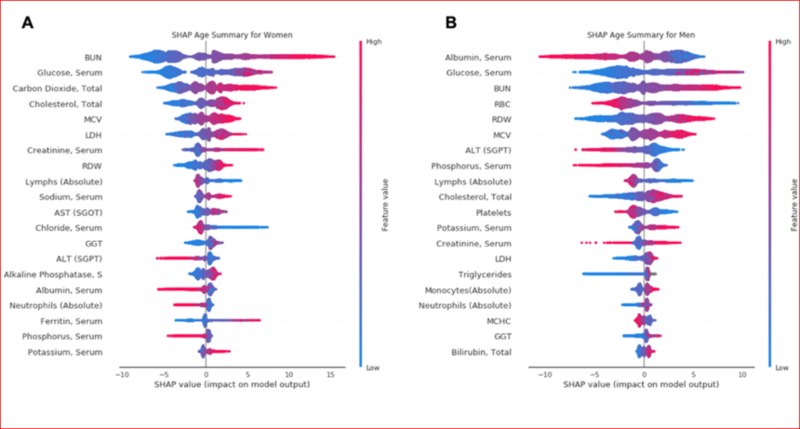 SHAP summary plots (Figure 2) were used to determine which markers have the greatest influence on predicted biological age...""
Should a free calculator based on this algorithms exist (or be developed?) I will certainly be curious to enter my data and check results. Putin E, Mamoshina P, Aliper A, et al. Deep biomarkers of human aging: Application of deep neural networks to biomarker development. Aging (Albany NY). 2016;8(5):1021-33.